Pool tables are an attractive and practical centerpiece for a family rec room, but with a lot of use, the felt on the surface can become scratched, torn, or otherwise damaged. It would cost an arm and a leg to have a professional come in and resurface the table and even more to replace it. If you want to try resurfacing the table yourself, it can be done in less than a day for only the cost of supplies. Remove all of the old felt from the surface of the pool table. If there is old felt on the rails remove it too. A utility knife may be needed to remove felt from the edges, and from around the pockets. Measure the length and the width of the main surface area of the pool table. Add 3 inches on to each side, and each end. Measure a side rail, and an end rail. Write down the exact measurements for the rails. You will need two pieces of felt for each measurement, as there are two side rails, and two end rails. Lay the felt face down on your work surface. Use a tape measure, straight edge and marking pen to measure and mark the felt according to the measurements. Measure and mark a piece of felt for the main surface and for each rail. Cut the felt to size with a utility knife or sharp scissors. Lay the main surface piece of felt on the main surface of the pool table. It must be centered and even. Fold back 1/2 of the felt, exposing the bare pool table surface, and apply a spray adhesive. Lay the felt on that half of the table down and rub the felt in a circular motion over the entire half of the surface to secure it. Do the same for the remaining half of the main surface area. Cut the felt along the edges of the main surface of the pool table, beginning in a corner, allowing felt to remain where the pockets are. 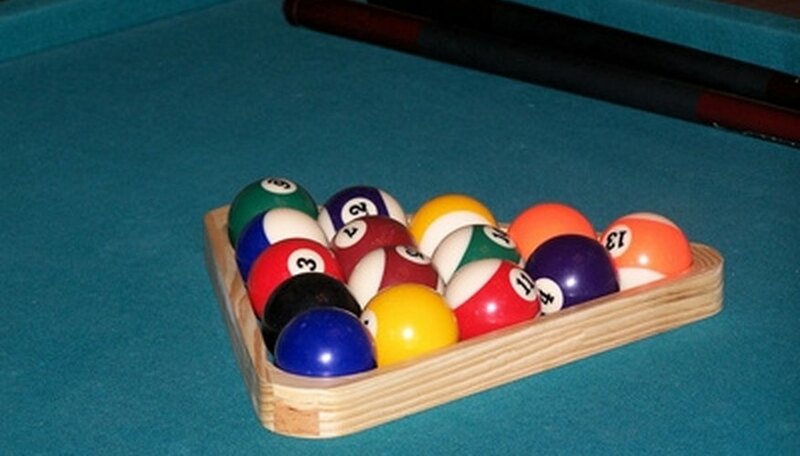 Leave a 3-inch edge along the width of each pocket but remove it from all other edges of the pool table. Lift the edge of the felt where it will go into the pocket, and use the spray adhesive directly on the backside of the felt. Press the felt into the pocket and rub to secure the felt to the inside of the pocket. Spray the backsides of the felt pieces that are meant for the rails. Press them into place on the pool table. Rub the surface of the felt gently in a left to right motion so the felt will stick to the pool table surface. Use a clean putty knife to press the felt down onto the adhesive along the edges. Allow up to two hours for the adhesive to fully set and take hold. Use a generous amount of spray adhesive to ensure a strong hold. Ventilate when using spray adhesive and avoid breathing in the fumes.